Sleep Group Solutions is a privately held dental & medical sleep medicine education, instrumentation, and in-office training company. Based in Hollywood, Florida, and established in 2005, SGS focuses primarily on dental treatment of snoring and sleep apnea. Rapid growth within SGS and the dental sleep medicine industry has been spurred by the fact that over $4 Billion is spent annually to treat sleep apnea with therapies that are largely unsuccessful and have managed to cumulatively treat less than 1% of the affected patients over the past 20 years. More and more physicians and dentists are seeking out SGS for their sleep needs. Today, Sleep Group Solutions stands alone as the only provider of a complete suite of solutions. Starting with continuing education courses and in-office training, screening, diagnostic and treatment instrumentation. With over 50 Million people in North America suffering with sleep apnea and less than 0.5% of the dentists currently trained and equipped to offer assistance, we can expect to see continued growth of this field over the next decade. By offering every piece of the education, screening, diagnosis and treatment puzzle, SGS provides a unique position to capitalize on this tremendous growth. Success in any field of medicine starts with proper education. Education creates awareness and puts clinicians in a position to offer assistance and solutions to a problem. SGS realizes the importance of educating physicians and dentists on not only the scope of the sleep apnea epidemic, but also the precise step-by-step protocols they can implement in their practices to help manage this problem. SGS is the world’s largest provider of dental sleep medicine continuing education with weekly 2-day seminars across North America. SGS instructors are all highly credentialed with unmatched experience and expertise in sleep dentistry. Customized in-office training programs are offered as a second tier of training as well as special events, study club lectures, and mini residency programs across the country. Eccovision Acoustic Rhinometer The Acoustic Rhinometer is a tool used frequently by dentists and otolaryngologists to measure nasal airway size and identify obstructions in the nose that could be contributing to the sleep disordered breathing problem. This is a quick non-invasive test that can be done in seconds proving the doctor with valuable information. 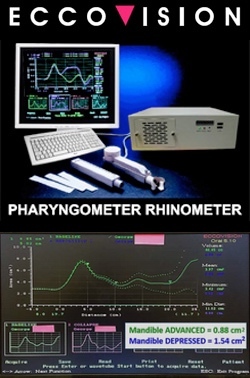 The Rhinometer test is reimbursed by private insurance and Medicare. SGS 3D Airway Software SGS engineers have developed airway imaging software to compliment the use of the Eccovision Acoustic Diagnostic Imaging System. This 3D airway software takes readings from the Pharyngometer and Rhinometer and renders a three dimensional airway complete with volumetric and point-by-point measurements of cross-sectional area. A home sleep study is only good when accompanied by proper diagnosis by a board certified sleep physician. SGS works directly with hundreds of sleep physicians across North America to provide this service through SGS’ web service www.interpstudies.com . 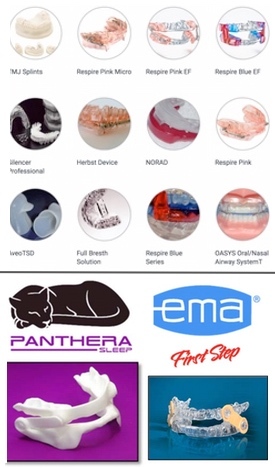 This site connects dentists and sleep physicians making it possible for legal diagnosis of sleep apnea to come from an Embletta X100 device dispensed by the dentist. This very affordable service enables patients to enter treatment earlier than if they had to wait for a sleep study in a sleep lab and provides dentists using home sleep testing with a valuable diagnostic option for patients who refused or could not go for a full in-lab study. During the 2-day SGS sleep seminar, we discuss and support all oral appliances on the market used in the dental treatment of snoring and sleep apnea. We cover appliances such as Myerson EMA, Narval CC, TAP 3 and TAP 3 elite, and the ZQuiet pro-plus. We demonstrate and discuss various dorsal fin, and Herbst appliances as well, with hands-on demonstrations. Some courses have dental labs onsite to discuss their appliances, lab, and processes. When the need arises for immediate treatment, appliance repair or a transitional device SGS has you covered with the EMA First-Step and NORAD appliances. These devices can be fabricated immediately in the dental office and delivered to the patient in the same visit to ensure your patient never has to sleep a single night without appropriate therapy. The in-home sleep apnea testing market has experienced explosive growth over the past two years. SGS is positioned as a leader in this market. We have partnered with the world’s largest sleep diagnostics company. SGS clients are using the latest technology and the most powerful, cost effective device available while being part of the largest network of dentists and physicians using the same hardware and software. Our home sleep testing program has opened the door for increased diagnoses resulting in more patients receiving the care they need. As part of the SGS training program for implementing sleep medicine in a dental office, clients are offered marketing assistance. SGS will share marketing letters directed to other medical professionals as well as sample newspaper and radio ad campaigns. Clients are also offered a series of patient information brochures discussing the link between sleep apnea and snoring, quality of life, children, women, cardiovascular disease, and diabetes. SGS also offers custom and design websites for our clients treating snoring and sleep apnea. Our new custom and design option websites will focus on sleep apnea, and offer patients information such as necessary definitions, statistics, home sleep testing info, and treatment options. The SGS websites are all about education, and being able to offer an affordable service, that is usually extremely expensive. 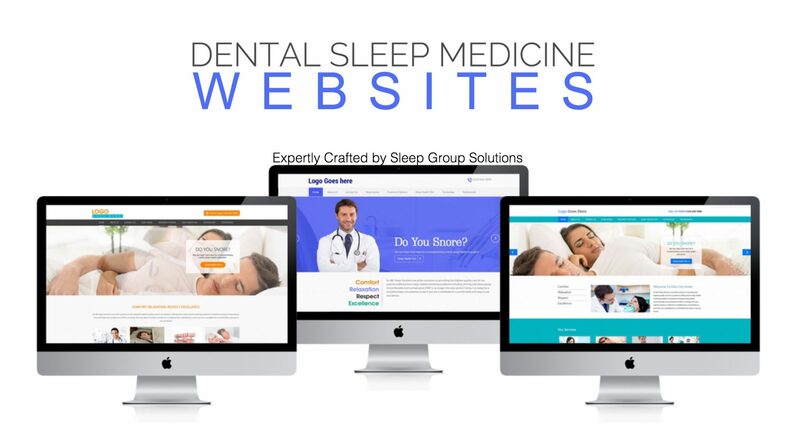 SGS wants dentists to thrive in dental sleep medicine; by offering affordable websites, dentists won’t need to recreate the wheel. 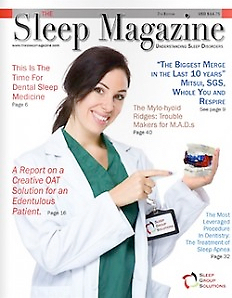 SGS is pleased to lead the way with Dental Sleep Medicine newsletters. The printed and electronic newsletter, Sleep on it! Is distributed to dentists across the country. The newsletter’s focus is on DSM matters that mean the most in the industry. Sleep Group Solutions publishes a quarterly journal called The Sleep Magazine. This publication goes out to tens of thousands of dentists and physicians and helps raise awareness and bridge the gap between the medical and dental sleep communities. The Sleep Magazine features editorials, clinical articles and case presentations from SGS client dentists, physicians and some of the biggest names in the industry. SGS launched this publication in 2009 and has received overwhelming praise; many doctors began using it as patient education literature for the waiting room. Future issues will bring more excellent articles and detailed information on protocols and technology for both dentists and physicians involved in the treatment of snoring and sleep apnea.